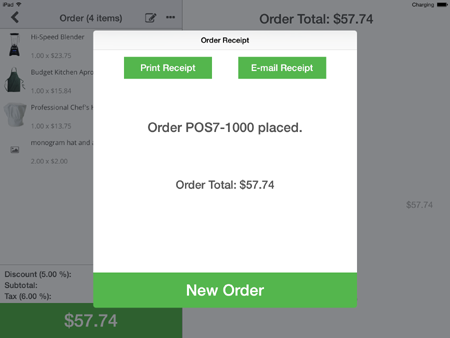 How do I complete the POS Order? If/When you're ready to proceed with the order, follow these steps to complete it. You will be taken to the checkout portion of the app. 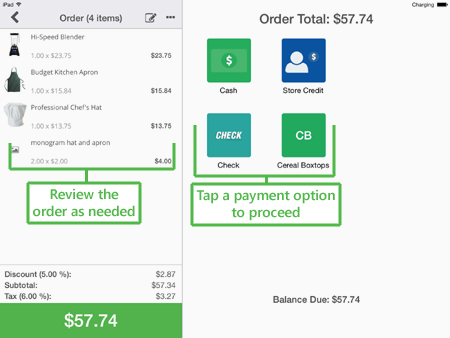 Once you're ready to accept payment for the order, you will tap the icon specific to the payment method that is set up on the app. 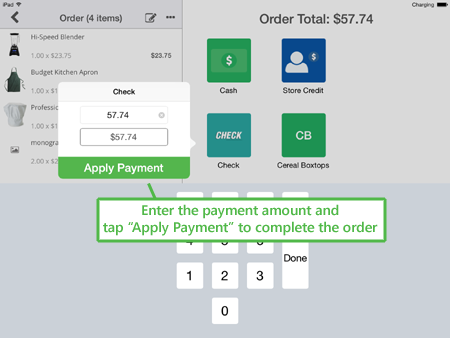 The payment methods shown on this screen will correlate to the payment methods you set up on the app in the App's settings area. Click here to review that information. Tap on the icon of the payment method being used. Enter the payment amount or tap the displayed balance to add the full amount. 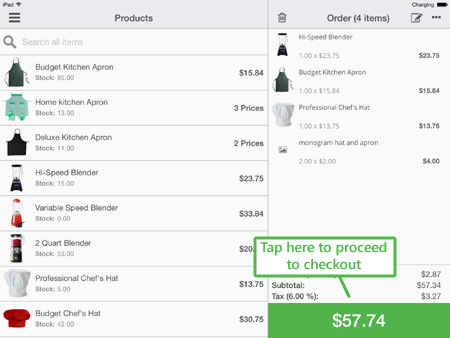 When entering the payment amount for the order, you can enter any value up to the order total. In other words, if the order total is $60, you can enter and apply any value up to 60. The app will then refresh the order with the remaining balance needed to be paid. This can be beneficial if you'd like to split the payment into multiple payments. For example, $40 paid in card, $20 in check or cash for the remaining balance. Tap on the "Apply Payment" button to finish. The order will be created and placed for the customer. From here, you may print the receipt or email it to the customer. 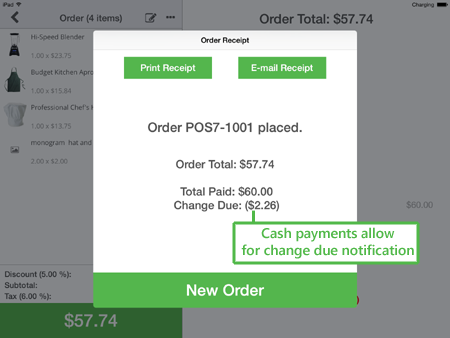 As mentioned previously, in the case of a cash payment, the app will allow you to enter a number higher than the total, and it will then provide you with a "Change Due" notifcation to give the customer back their change. Up next, we'll cover Printing and emailing the reciept in more detail.